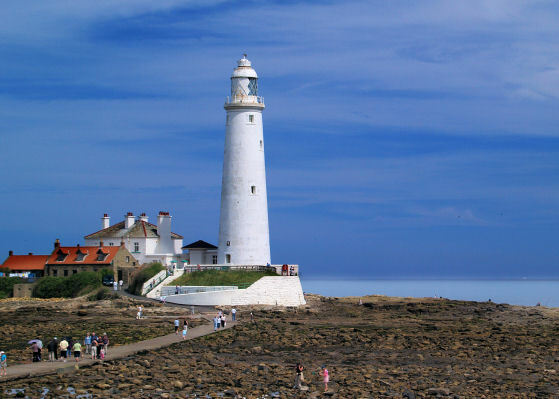 There has been a light on St. Mary's Island since mediaeval times. The present lighthouse was opened in 1898 to replace the old lighthouse on Tynemouth Point, the last of many which had stood there for over 400 years. It was operational, run by Trinity House, for 86 years from 1898 until decommissioning in 1984. 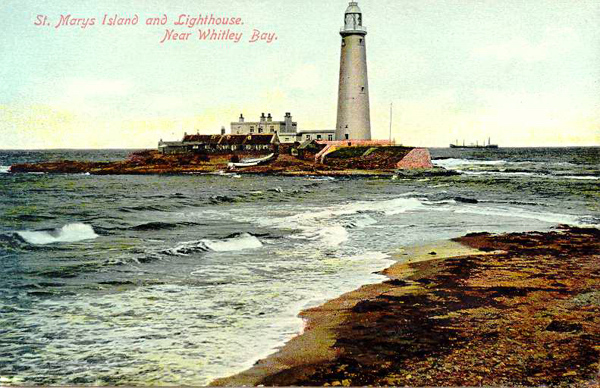 In the autumn of 1896 work was started on the building of the new lighthouse on St Marys Island. The contract had been given to Mr. J. Livingstone Miller of Tynemouth. Three quarters of a million bricks were used in the construction of the tower, and it is 120ft (36.6 metres) from base to vane. Building the lighthouse in 1897-1898 cost £8,000. The two lighthouse keepers' houses were built of Heworth stone, and the lighthouse of brick covered in cement, with a novelty for that day and age - a covered passage for the keepers to pass from their cottages to the tower “in comfort and security however furiously the elements may rage outside”, to quote a newspaper from that time. On 31st August 1898 the lighthouse was illuminated for the first time. you see it was not at this time painted white. The first lantern was lit by paraffin and continued to be until September 1977, the paraffin being delivered twice a year and stored in a huge tank under the tower. The causeway to the island was built in 1929, and rebuilt in 1965/66. The first causeway had an area in the middle which was always under water, so there were stepping stones for the adventurous and regular boat trips from Briardene beach to the seaward side of the island. St. Mary's was one of the last of the British lighthouses to be modernised, it was electrified in 1977 and its original lamp went to the National Lighthouse Museum in Penzance (now closed). 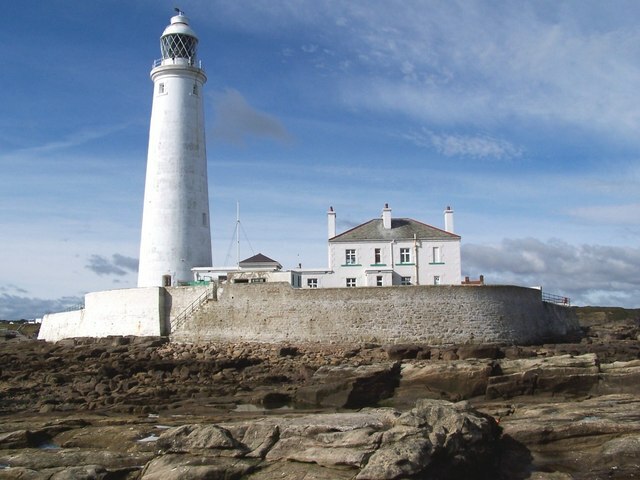 The original Fresnel lens was also sent to the lighthouse museum in Penzance (now closed), and the current lens was transferred from Withernsea Lighthouse which had closed in 1976. In 1982 the light was automated, and the attendant visited the island once a day to make sure that everything was in order. In 1984 the lighthouse was lit for the last time, taken out of service because modern navigational aids made this lighthouse, like many others now obsolete. 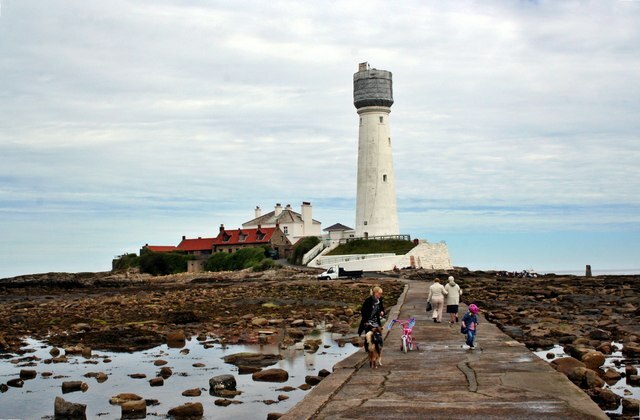 After deactivation, it was transferred to the local government as a tourist attraction, the Friends of St. Mary's Lighthouse was organized to work for its preservation. 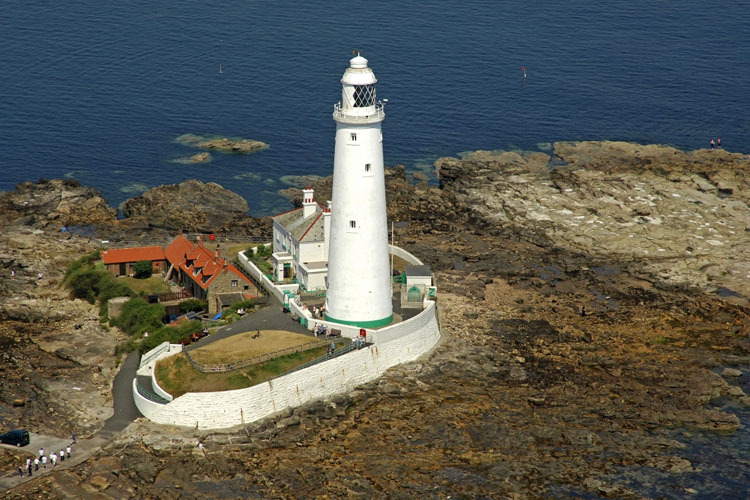 In July 2007, the North Tyneside Council announced £130,000 in repairs and repainting for the lighthouse. A master plan for the future of the island and light station is being prepared. The original Fresnel lens being returned from Penzance to be displayed in the base of the tower. Life for the lighthouse keepers was not easy, in spite of being so close to the mainland. Until 1948 fresh water was collected on the flat roofs of the keepers’ cottages and passed through large filters in the kitchens, water being brought over by boat in barrels if the supply dried up in the summer. The keepers continued to use Elsan toilets until 1954, when the privy conversions cost £58.15.1d. There was no electricity on the island until 1957, heating and cooking was by coal or driftwood fires. The children of keepers went to school in Old Hartley and Seaton Sluice. They were rowed to the shore and then had to walk over the headland. The keepers shifts were four hours during the day, and two hours at night, two keepers during the summer, and a third, a supernumerary keeper during the winter. Throughout the day and night the weather was sampled from the balcony every three hours and a log was filled in. As soon as the light was put out at dawn, curtains had to be drawn round the lamp room to prevent the sun’s rays from igniting the paraffin. Then the lamp and all its parts had to be cleaned and polished, even the parts that no one saw. The lamp room and rest room were swept and dusted, the glass reflectors polished, the stairs washed down two or three times a week, and the brass hand rail on the stairs polished. Every three years a party of officials from Trinity House visited the lighthouse and inspected the station. Decisions were then made about painting and repairs, and keepers were told if they had to move. 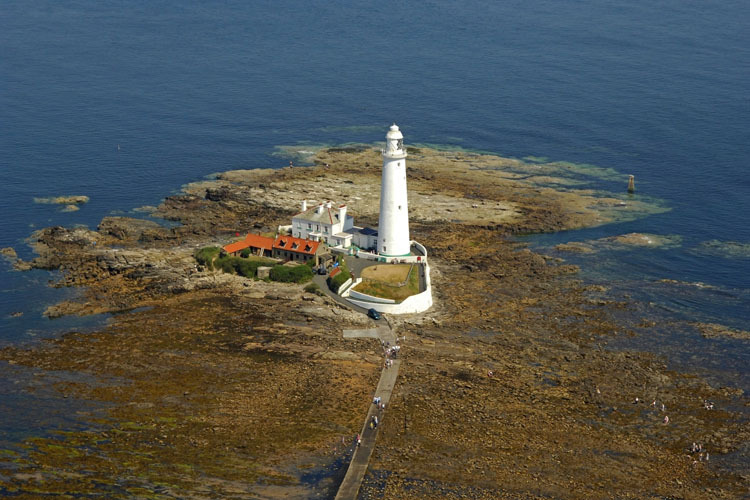 St. Mary’s Lighthouse was opened in 1898 as a replacement for the lighthouse on Tynemouth Priory headland. In the 12th century the monks of the Priory had kept a light burning in the chapel which they had built on St. Mary’s Island and one in the tower of their church at Tynemouth. This light was replaced by Colonel Villiers, Governor of Tynemouth Castle in 1664, by a lighthouse which stood in the north east corner of the headland, built of stone from the ruined Priory. It stood over 79ft (23m) high with a top which was roofed and enclosed on three sides. The keeper lived in the base with his family, and it was his job to keep the coal fire at the top of the tower burning brightly on the incoming tide in all weathers. It was partly rebuilt in 1775, and in 1802 the coal light was replaced by a revolving oil lamp with reflectors. By the 1890's there were great problems of visibility with the old lighthouse. It gave off a red light, and this was often obscured by the smoke from the steam ships and the industry on the River Tyne. 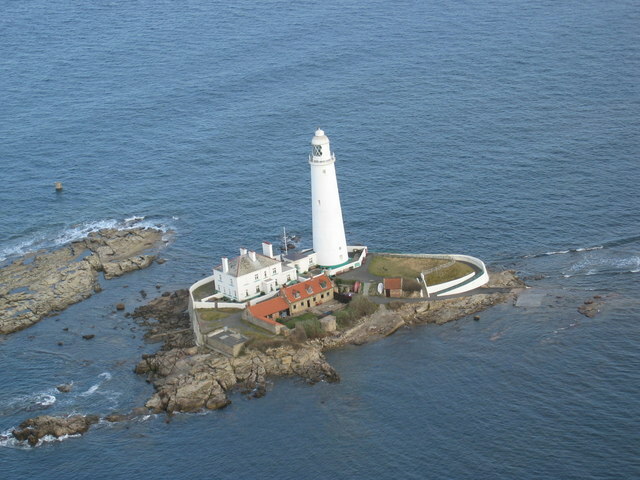 Trinity House decided that a new light should be situated away from the river mouth, and St. Mary's Island was chosen as the site to replace it. The old lighthouse was not demolished until after St. Mary’s had been opened. Unable to avert some shipwrecks the keepers, nevertheless, were there to help when tragedy struck. In January 1913 the Russian four-masted iron barque the “California” was driven onto the rocks on the south of the island in a sudden storm before she could set her sails. Valiant efforts were made to get a rescue rocket aboard, but the ship broke up and the rescuers could only save the men who were washed ashore - the captain and seven crewmen. Eight sailors were drowned, and the captain lay seriously ill in the island cottage for a week after his ordeal. The remains of the ship can still be seen at low tide. 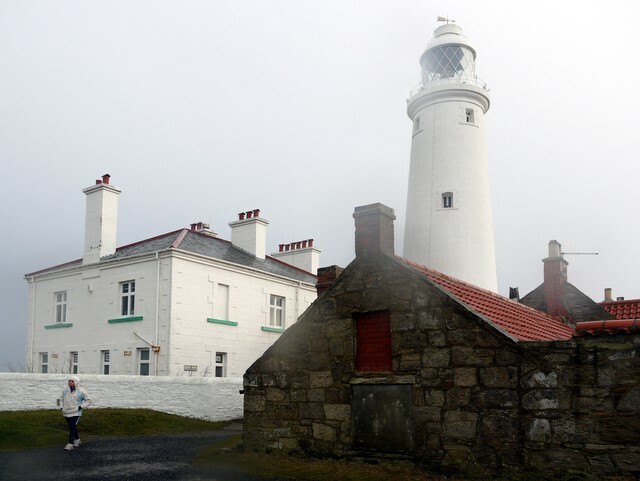 The lighthouse was bought on behalf of the local community by North Tyneside Council with help from the Countryside Commission and the R.W Mann Trust. It's now open as a tourist attraction. It can be reached between the tides via a short causeway from the car park, St. Mary's has all the fascination of a miniature, part-time island. Visitors can climb the 137 steps inside the tower to the lantern room to enjoy spectacular views along the North East coast of England. On a clear day the views from the top of the tower stretch from the North Yorkshire coast to the Cheviot Hills. If they cannot manage the steps, a live video facility allows them to experience the same panorama at ground level. Other exhibits explain the history of the lighthouse and provide insights about the wildlife outside. The small Nature Reserve comprises rock pools, a beach, freshwater ponds and cliff top grassland and provides habitats for a rich variety of marine life and spectacular flights of resident and migrating seabirds and waders. More information on visiting is in the grids below. Brick tower with lantern and gallery, painted white. A complete light station, with keeper's houses and other buildings. There are two large, pay and display car parks on the mainland. One of the car parks has a public toilet. Access is via a causeway when the tide is out so opening times are dependent in the tides. See Access times for 2015-16 however this is a guide, the weather can effect tide times. Best Times to Visit: Check opening, access and tide times.